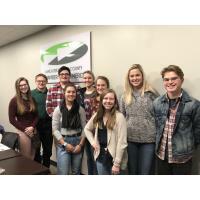 LANCASTER, Ohio --The Fairfield County Foundation has established a Youth Advisory Committee to empower Fairfield County high school students through leadership and community service. Members gain real-world experience in overseeing financial and human resource components of a new grant cycle for youth projects. The Youth Advisory Committee and the Foundation’s Board of Trustees has launched the first Youth Project Grant Cycle with $10,000 to support youth efforts in Fairfield County. The committee will manage submission reviews, complete site visits, and make recommendations to the Board of Trustees. Nonprofits may apply for grant dollars beginning on February 1, 2019 through March 15, 2019. The guidelines and application can be found at www.fairfieldcountyfoundation.org/grants. Juniors and seniors from schools across the community make up the 12-person committee. Schools represented include Fisher Catholic High School, Fairfield Union High School, Berne Union High School, Fairfield Christian Academy, Lancaster High School, Pickerington Central High School and Liberty Union High School. If you would like to learn more about The Youth Advisory Committee or the first Youth Project Grant Cycle, visit fairfieldcountyfoundation.org or contact the Fairfield County Foundation. The Fairfield County Foundation is a 501 (c) (3) non-profit that along with its supporters, helps to sustain and enhance the quality of life and economic viability in our community. Its scholarship program helps to sustain opportunities for local youth to achieve their academic goals. The Foundation was formed in 1989 and grants today continue to support the arts, children’s programs, health and wellness projects, community development, academics, and more. For more information about the Foundation, please call 740-654-8451 or visit www.fairfieldcountyfoundation.org.